Enjoy an exclusive harp retreat with the best professors, in amazing conditions! SOLD OUT! - Emmanuel Ceysson - SOLD OUT! Gold medallist of the 2004 USA IHC, First Prize of 2009 Munich ARD competition, Principal Harp @MET opera, Emmanuel is professor at the Mannes School of Music, and one of today’s most recognized harpists. Still confirming our exciting next professor! Our grounds are situated in Billlorgues, an amazing village lost in the Aveyron department, in the Southwest part of France. Only a 75 minutes flight from Paris Orly airport (ORY) to Rodez-Aveyron airport (RDZ), or by sleeper train to Saint Christophe-Vallon or Rodez stations from Paris Austerlitz. Transfers from these locations are included and will be done by or team. Premium harps at your disposal! As the exclusive Salvi and Lyon & Healy harps dealer in France, we will have an exceptional selection of instruments available for our participants! And so that you only have your music to worry about, music stands, harp benches, and harp strings will be lent to you also… L’Instrumentarium has you covered! We offer a limited number of single, but also more shared double or triple bedrooms. For our underage students, coming with their accompanying parent/legal tutor, a very limited number of double rooms are available. 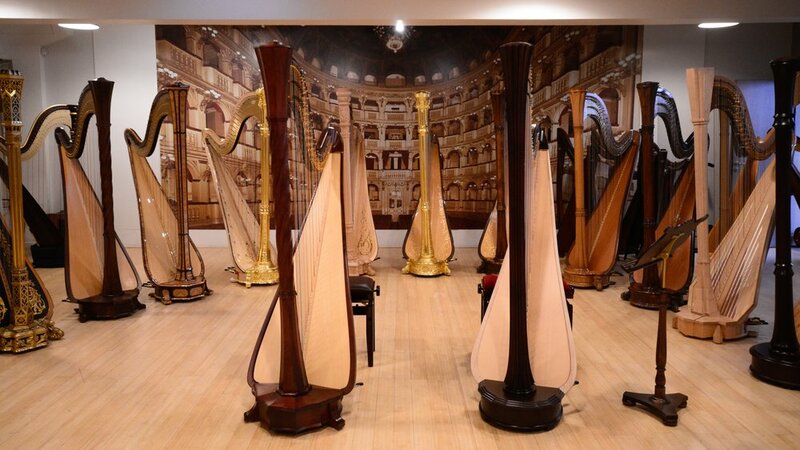 Harps will be kept in the rooms and the practice studios for maximum availability to the participants. You can be sure to have a harp to practice any time of the day! Did you say food?? To really give you a true taste of countryside France, breakfast, lunch and dinner, freshly prepared, will be served daily at the common table, mostly locally sourced, including fresh and organic produce from the local farmer’s market or grown on the property grounds!